Count on Complete Maintenance Services to keep your facility looking its best. Our team of conscientious workers has been providing great service to the central Pennsylvania area for decades. No job is too small or too big. 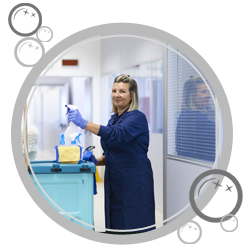 At our disposal, we have the latest in industrial and commercial cleaning equipment. Also, we use environmentally friendly cleaning agents. If your business wants to look professional, you need our professional services. Whether it's carpet or tile, it's important to us to keep them in pristine condition to make the best impression on your customers. There are a lot of commercial cleaning agencies you can choose from. That's why we at Complete Maintenance Services go the extra mile for you. We are a trusted name in the janitorial industry, providing over 25 years of maintenance work throughout Central PA.
we have remained true to our principles, doing a complete, quality job at a fair price. Contact us for more information on how you can impress your customers by using our janitorial services. Since opening more than 25 years ago, we have remained true to our principles of doing a complete, quality job at a fair price. Located in Mechanicsburg, we service clients from both the East and West Shore territories. We take pride in the close relationships we have established with our clients; which has secured our reputation as one of the most reliable and trusted cleaning agencies in the industry. This is confirmed by the number of referrals and returning clients. If you answer yes to any of these following questions, you need to contact us immediately! • Are you unhappy with your cleaning services? • Is your cleaning company unreliable?